So many body parts to mobilize, so little time. You’ve got to prioritize your mobility. There isn’t enough hours in the day to hit everything that needs work (for some of you out there). And who wants to spend hours mobilizing anyway? Not me! So here are THREE (yes, just three) mobility exercises that I believe most people NEED to be doing on a daily basis. With so many of our waking hours spent in a seated position, our hip flexors get pretty tight. Open those bad boys up on a regular basis and you’ll probably notice that niggly lower back ache fade away. The back of the shoulder has a tendency to get tight and restricted, especially with long hours spent clacking away at a keyboard. This can lead to the shoulder sitting further forward in the joint, resulting in pinching with overhead movements. 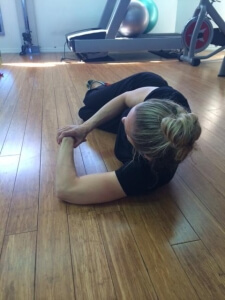 Try this stretch on a daily basis to help give that shoulder a bit more breathing space. Be careful with this one as it can be a bit painful! Stiffness through the thoracic spine can limit our shoulder range of movement. Grab your trusty foam roller and spend some time arching over it to open up the chest, shoulders and middle of your back. All of these can be found in the MobilizeMe App – a mobility app I created to help you negotiate your way around the sometimes confusing world of stretching and mobility! All the exercises come with photos and how-to descriptions, and some have video links to the exercises in YouTube as well! If you would like some help with these or are unsure if they are right for you, MobilizeMe Physiotherapy on the Gold Coast will be able to help point you in the right direction! We offer FREE ASSESSMENTS (with your Private Health) for NEW CLIENTS!